Today I am going to share about my attempts to take better care of my house. I try to take good care of my husband and children and to make sure I give them the majority of my time. I want them to know that they are valuable to me and that they are loved. I find, though, that sometimes I end up putting off housework until everything is a complete mess! My dear sweet hubby never complains, but I know that he doesn’t enjoy coming home to a messy, chaotic house–especially if he’s been traveling for a few days and is just getting back home. 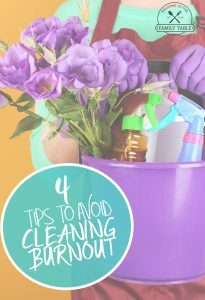 I’d like to share with you 5 simple tips to keep in mind if you are trying to get or keep your home fairly well cleaned and organized. I have to say that housework is one of my least favorite things to do. I’m trying to change that attitude, though. For one thing, a crummy attitude doesn’t mean that the work doesn’t have to get done. It does. A good attitude toward work definitely changes my mood and my overall disposition, however, and it helps me to be able to enjoy what I’m doing–even if it’s housework! I also have to keep in mind that my attitude affects my children and their attitudes! If they see me looking unhappy or frustrated doing my work, they will have those same attitudes doing their school work, yard work, or housework. 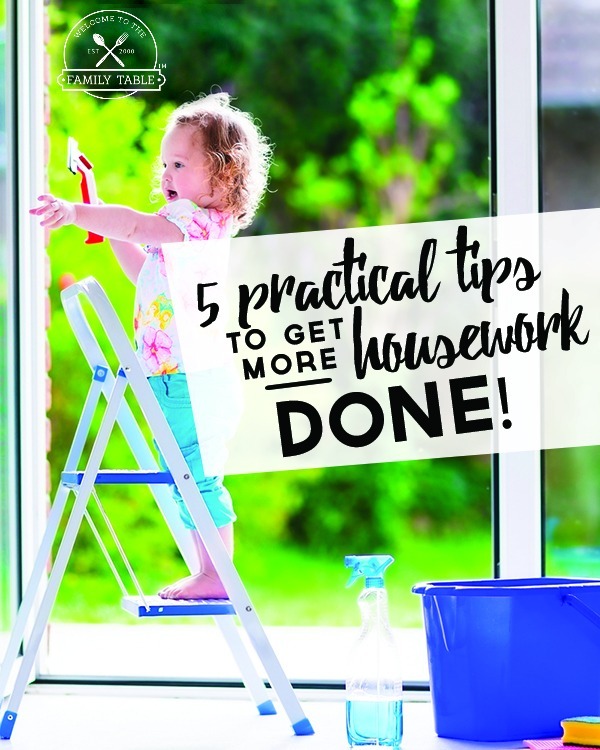 You don’t have to make a really formal, elaborate housekeeping plan if that’s not your style. My plan isn’t complicated at all. I have a simple spreadsheet (or you can just write it on a piece of paper) with each day listed. (Monday through Saturday. Sunday is God’s day.) There are a few jobs that must be done every day. 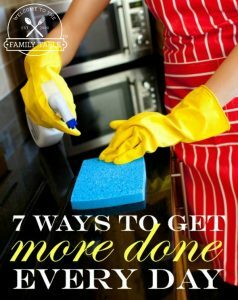 For example, the kitchen must be cleaned, all dishes done, counters wiped off, etc., every single evening after dinner. We are all expected to put dirty clothes in the hamper in the bathroom each day. The kids straighten their rooms each morning and/or afternoon. Those sorts of things are much easier to do if done on a daily basis and not allowed to pile up. Here are some free printable chore charts for young children here and here. Also, I just can’t stand to do laundry every single day. So I do a few loads of laundry every Monday. Then I usually do a few more loads each Friday. That kind of spaces out a job that’s not my favorite, and it helps me make sure my hubby has clothes for the work week and for the weekend. My plan is not elaborate, but it is working well for my family! Are you thinking that a plan like that won’t work for you because you have years of clutter and junk lying around everywhere? Do you feel overwhelmed with so much that needs to be done that you can’t seem to get started? I’ve been that way, too! Many times. I still get that way sometimes. Here’s how I handle it. First, when I find that the entire house has gotten cluttered and messy, I choose one room to concentrate on at a time. Then I choose one section of that room to deal with. Each day, I simply clean/declutter one little section of that room or closet, etc. If that feels like too much, I simply choose one square foot of table, floor, cabinet, or wherever, and I concentrate on cleaning just that one little square foot. As a mom who is often and easily overwhelmed when facing a huge task, this thinking has helped me so much! Even I can handle cleaning one square foot at a time! I am trying to impress upon my children the fact that keeping the house clean is much easier than having to clean up a huge mess! It just makes sense that, if you do the dishes every night after dinner, it takes much less time than if you let 3 days’ worth of dirty dishes pile up. I have to remind myself of that fact, too–especially at night when I’d rather go to bed than straighten up everything. 5. You can’t do it all on your own! I have always been terrible about not having my children help out with housework. Because my oldest child is severely autistic and has very poor motor skills, she has never been able to do much to help in the house. Since she was my oldest, I just never really understood how much my other two children were capable of doing to help! 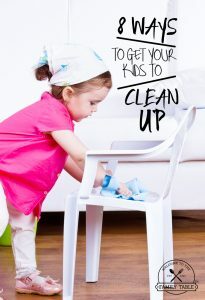 I have realized, though, that I absolutely have to have my children’s help to get and keep the house clean. My hubby helps out a lot when he’s not traveling, but it’s up to the kiddos and me the rest of the time. Do you have any simple tips that folks should keep in mind when trying to keep a tidy house? Please share! Wendy lives in the South with her wonderful hubby and 3 great kiddos! She is a Christian, homeschooling, work-from-home mom. She and Scott were high school sweethearts and have been married for more than 20 years. Her oldest child has autism, and Wendy began homeschooling her at age 2. Her son, a typical boy, would rather do anything than school! Her youngest child is a little social butterfly and people lover. Wendy loves reading and quilting and will hopefully return to scrapbooking sometime soon. She blogs at Homeschooling Blessings and at Hip Homeschool Moms where she is co-owner and social media director.